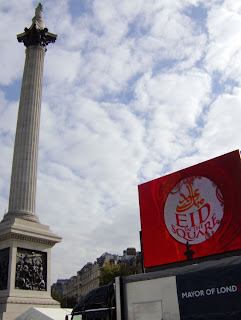 Yesterday, I went to Trafalgar Square for this year's Eid celebrations. 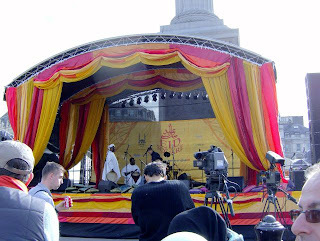 It was bigger and better this year with a line-up of Muslim artistic talent taking the stage and providing an afternoon of thrilling performance. 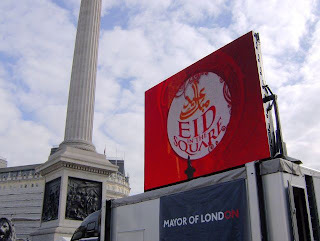 Eid in the Square celebrates Eid-ul-Fitr, the Islamic holiday marking the end of Ramadan, the month of fasting. It is a festival of great happiness and celebration and is rejoiced by millions of Muslims around the world, bringing communities, friends and families together. The atmosphere was great! 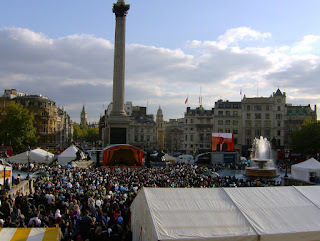 The square was packed with people; the Muslims dressed in their colourful Eid clothes. 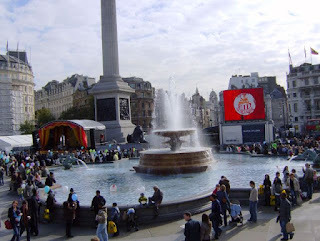 There was also a Muslim bazaar and a children's area with interactive workshops. Saw this great article on digg today. I am an introvert and people tend to think I'm arrogant and shy when I really just want my own space and hate small talk! The reason why the majority of people think that there’s something wrong with introverts is because the majority of people aren’t very knowledgeable when it comes to introverts, in terms of why they are the way they are and why they do the things they do. Extroverts tend to have to drag introverts to parties, to convince them to go and sell them on attending social engagements. When introverts politely decline, extroverts automatically assume that something might be wrong so they always ask if everything’s all right and of course, everything is all right. It’s just a common misunderstanding. When extroverts see a pattern like this developing, they automatically assume that introverts are shy or anti-social as that can be the only logical explanation to them. What’s more, when extroverts try to engage introverts in small talk, it seems like they hit a brick wall. The bottom line is that introverts are just wired differently than extroverts. There’s nothing "wrong" with them. They just become energized through different processes depending on where the majority of their brain activity takes place. Extroverts thrive on small talk. 3. Introverts do like to socialize - only in a different manner and less frequently than extroverts. Most introverts are well aware of all the social nuances, customs, and mannerisms when it comes to interacting with other people, but they simply don’t socialize as much as extroverts, which makes it easy for extroverts to assume that introverts are not socially well adjusted, as they have not seen much evidence of them interacting with other people. This is precisely why I wrote this article, because if the extroverts can become more educated about introverts, introverts will be able to feel free to stay true to who they are, and that’s a good thing from society’s point of view. Trying to "turn" an introverted person into an extroverted person is detrimental because it gives off a subtle suggestion that there is something wrong with them, hampering their self worth and esteem when there is absolutely nothing wrong in the first place. And for those of you not interested in science, but pop culture, you’ll be surprised to see a lot of well known names in Hollywood are introverts as well. Julia Roberts, Steven Spielberg, Tom Cruise to name a few as well. Introverts have a lot to bring to the table. They have an amazing ability to discover new thoughts, an uncanny ability to focus, to concentrate, to connect the dots, to observe and note things that most people miss, to listen extremely well and are often found having a rich and vivid imagination as well.